If you’re learning Thai or interested in getting started, I think you’ll find this grammar guide really useful. Though some similarities can be noted, Thai grammar is more straightforward than English. With English, one is required to memorize numerous rules, and there are some exceptions that need to be considered to create flawless sentences, which also adds to the frustration of learning the rules. So it can be very daunting to many non-native speakers. What’s amazing with Thai is that by just learning a principle or two, you can easily construct grammatically correct sentences. Of course, some issues will still appear during learning, but compared to French or Spanish, I bet you can easily pick up the rules of Thai grammar. So, if you have to get one thing from this lesson, it’s that the rules of Thai grammar are very easy to understand and you can learn them! There are very few fixed rules, and just like English, the language, in general, is based on the use of subjects, verbs, and objects to communicate a complete thought. So, if you’re ready, let’s dive in and explore. 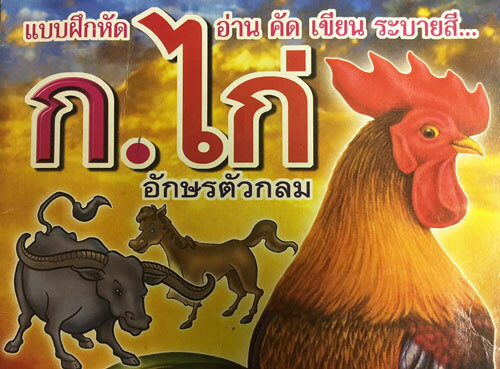 This the cover of a Thai textbook for kids. You can find them everywhere in Thailand for as little as 20 Baht. They have basic grammar and alphabet lessons inside. They are great for learning Thai. Grab some when you visit Thailand. Aside from the way the language sounds when spoken, another reason why many people think learning Thai is overwhelming is the alphabet. We have our own distinct alphabet, which doesn’t make use of Latin letters. Learning the alphabet comes hard at the start, as with any other tasks, but you’ll realize it’s not that difficult once you get the hold of it. Don’t worry though, you can pick up some Thai words right away without knowing the alphabet. However, the alphabet will prove to be beneficial if you’re planning to stay or study in Thailand long-term. Like Chinese and Korean, the meaning of most Thai words is based on tone. Depending on the speaker’s tone, a word or phrase can mean something different. Even foreigners advanced in Thai make tonal mistakes, but Thais can usually detect pronunciation issues and understand what you are trying to say, because much of the meaning is also drawn from the context of the conversation. Often, Thais omit some words from a sentence, which can impact learners positively or negatively. Positively, as it will be easier to construct sentences using fewer words, and negatively because when you learn formal Thai you may become confused to hear Thai people using much shorter versions of the sentences you have learned. I recommend using a program like ThaiPod101 at home to start learning basic sentences. Fortunately, the basic sentence structure in Thai is similar to English, where we have the subject, followed by the object then the verb. Please note that transliterations may vary. For example you may see the above written as phŏm yoo krung tep, or another similar way. I tend to alter my transliterations a bit. This is because in my experience in England, and with foreigners in Thailand, I find that many of the standard transliterations do not sound the way Thai people and academics think they do. As you can see, the simple sentence above follows the SVO word order. Because of this familiarity, English speakers may have less difficult time adjusting and learning how to make simple sentences. Here are some considerations to remember under sentence structure. Like in English, it should always come after the subject. A little tweak from English grammar, Thais put an adjective after the noun it describes. It is the exact opposite in English, where adjectives are placed before the noun they describe. Regardless of the number of adjectives that describe a noun, the rule stays the same. (You have a beautiful house). In English, the form of verb used is dependent on many factors: the person, number, tense, and even gender of the subject. In Thai, however, you can drop those conjugation rules because the verb simply stays the same. May the subject be we, you, I, he, or she, the verb doesn’t change. Unlike in English where the placement of adverbs depends on their type, adverbs in Thai are always positioned at the end of the sentence. He/She is eating pineapples fast. If you want to indicate a tense, such as if the verb was done in the past, all you have to do is add a word before or after the verb (the position of the additional word will depend on the tense). Actually, the Thai language doesn’t have a past tense. What we do is add a time word to communicate the tense. There can be many words to indicate time in Thai, and it can be an exercise in vocabulary to memorize all of them. He/She liked the pineapples yesterday. To indicate a present progressive tense, e.g. the action is going on or happening right now, you simply add the word “gam-lang (กำลัง)” before the verb in your sentence. This tense tells us of a continuous action that was started in the past and is still going on or something that has been completed at some point. To communicate this tense in Thai, just add the word “láew (แล้ว)” at the end of your sentence. He/She has been eating pineapples. To indicate that an action will happen in the future, merely add the word “jà (จะ)” before the verb in the sentence. This is done with or without a time word indicated that refers to the future. Another basic lesson in Thai grammar is forming sensible questions. Since most of the time, what we do in an unfamiliar place is ask, this will be beneficial if you have plans to visit Thailand, either for work, study, or holiday. When we ask something in English, the tone of our voice naturally rises at the end of the question. This should not be the case in Thai, as it can be hard for Thais to decipher what you really mean. Remember, Thai is tonal. The 5W1H, which stands for what, when, where, who, why, and how, are always placed at the end of the sentence. Pay attention to the examples below. If you just want to ask a simple Yes or No question, just form your sentence and merely add the word “mái (ไหม)”, which is a question particle, at the end of it. Saying “mái (ไหม)” plus the verb or adjective if the answer is no. To ask for something, such as water or tissue in a restaurant, just use the word “khăw (ขอ)” to begin the sentence, followed by the thing you’re asking for. To make it more polite, add “noi (หน่อย)” at the end. “noi (หน่อย)” is similar to “please” in this context. To ask someone a favor, a similar rule applies: you just need to start your sentence with the word “chûay (ช่วย)”, which can translate to “help” in English but can be interpreted as “please”. Of course, there are many other rules not mentioned here that are too complex for beginners, but I’m sure this is enough information for one day. My advice is just to dive straight in and start learning words. You will surprised how quickly you can form sentences if you learn 1 or 2 word a day. Please consider that English is not my first language. So if I have commented on the English language, or explained Thai incorrectly, please forgive me as I’m doing my best. the Thai grammar parts gave me alot of help.I could understood easily.I hope your next lessons will be fruitfull to us .many many thanks.I am from the state Assam/India/Buddhist by religion. You made it so much easier to than what it actually is.